Face-lit channel letters (aka front-lit channel letters or illuminated letters) offers your business the visibility you desire. Unlike other marketing and branding pieces you will spend your money on, face-lit channel letters will work for your business 24/7 with constant visibility to your customers. Our Indianapolis based sign company has serviced and installed countless face-lit channel letters throughout Indiana and surrounding areas. 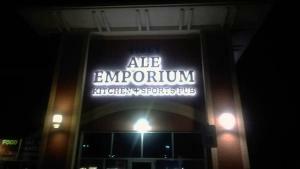 Unlike some of our competitors, we only use quality materials when building your face-lit channel letters. 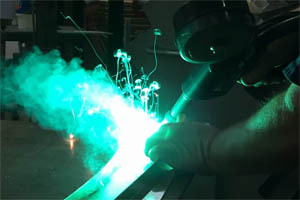 This starts with our superior LED technology that we use in every sign that we manufacture. 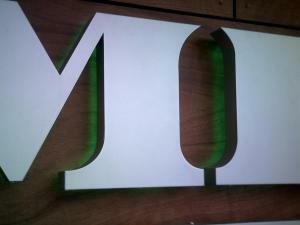 Face-lit channel letter faces are primarily constructed with 1/8″ acrylic. There are usually three types of acrylic that are used that each have their own set of benefits. (7328) This acrylic is best used for white face-lit channel letters. When compared to the 2447 white acrylic in daylight, you will notice that it has more of a pure bright white coloration. It is only slightly less bright at night than when compared to the 2447 acrylic. However, it still lights very bright, especially paired with our AVL Samsung LEDs that we use in almost every sign we produce. (2157) Red acrylic is used when producing…you guessed it, red face-lit channel letters. While we have several red acrylics to chose from, we have compared all options both at day and at night, and have concluded that the 2157 red acrylic offers the best illumination and also looks great during the day. “Returns” is basically another way of saying “the sides of your letters”. At ISF Signs we use the best brands of prepainted coil stock that comes pre-painted from the manufacturer. We also can paint your returns to any color you would like in order to match your branding guidelines. The returns of face-lit channel letters are typically 5″ deep, although we can go down to 2 1/2″ deep as a premium upgrade. Trimcap is the plastic molding that is glued to the face and mechanically fastened to the returns of your letters. 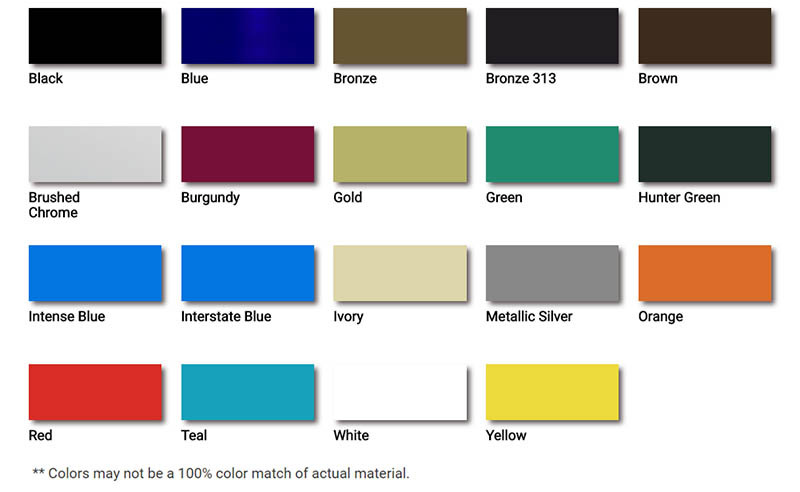 Trimcap comes in a variety of colors that our sales rep can present to you during your sales consultation. While it is possible to paint trimcap, we recommend picking from one of the predefined colors. When painting trimcap the painted color can flake off down the road, giving you a less than desireable appearance. 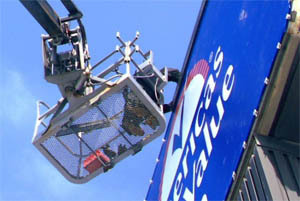 LEDs are used in all face-lit channel letters that we produce. 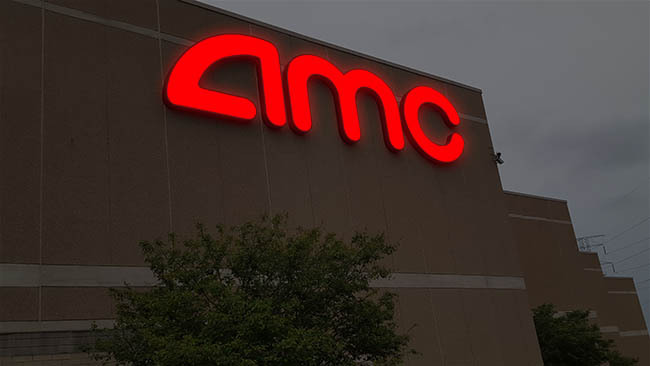 We primarily use AVL Samsung LEDs in every face-lit channel letter unless your branding guidelines dictate otherwise. We have done extensive testing on this brand, including leaving them in a freezing bucket of water for 6 months. We have found this brand to be the pinnacle of LED technology and we strongly recommend it’s use in all of our internally illuminated signage products. LEDs come in a variety of colors. 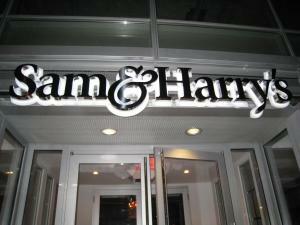 For white LEDs (used in 90% of our signs) we primarily use 6500k for the color temperature. 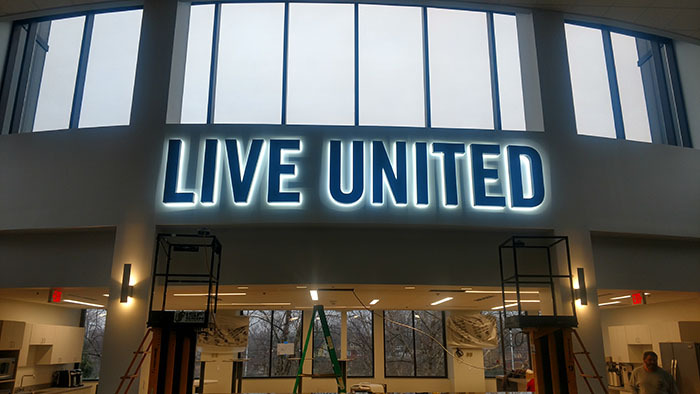 We have found this to be the best color temperature for internal sign lighting that really makes your graphics pop on your face-lit channel letters. The other color that we use is the AVL Samsung Red. When paired with the 2157 red acrylic, your sign is sure to pop! 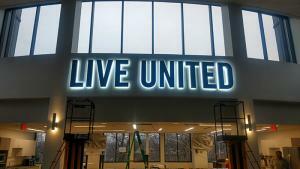 The insides of your face-lit channel letters will be painted white. 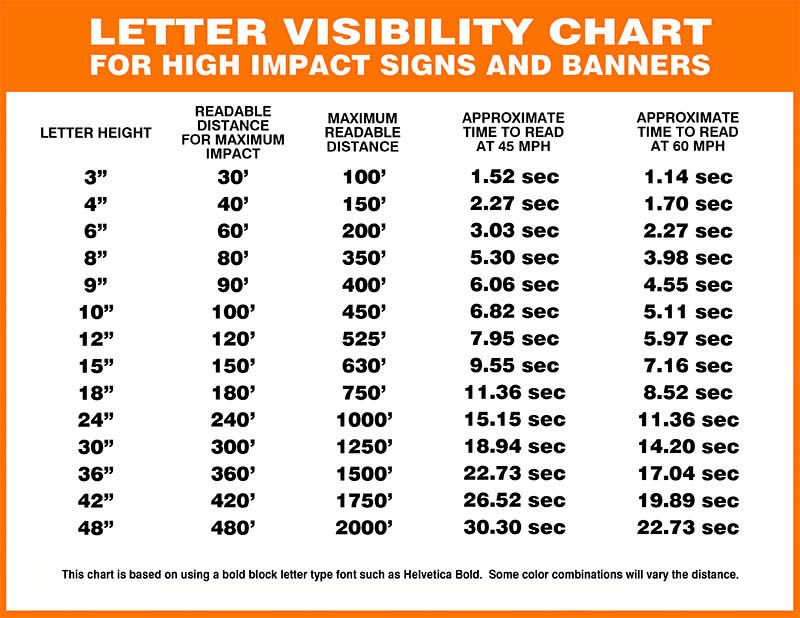 This offers the most reflectivity inside your letter to make sure you get the maximum illumination coming out of the face of your face-lit channel letter. The backs of our face-lit channel letters are constructed with .063 aluminum, where the inside facing of the aluminum is painted white for reflectivity. A raceway is the term used for the aluminum rectangular box you often see behind channel letters. 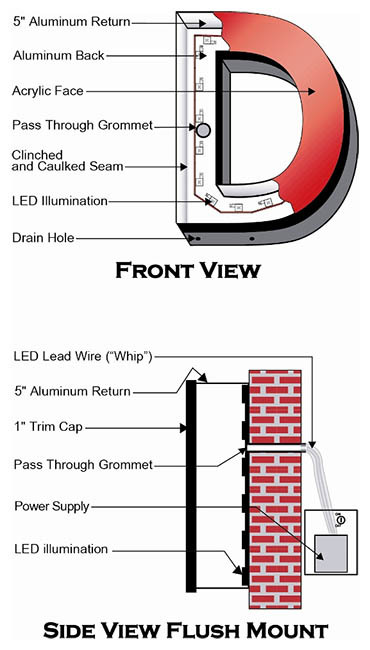 Often times building owners will only allow raceway mounted face-lit channel letters in an effort to reduce the number of holes in their buildings. Raceways are also great to reduce the amount of time needed for installation and future service calls. 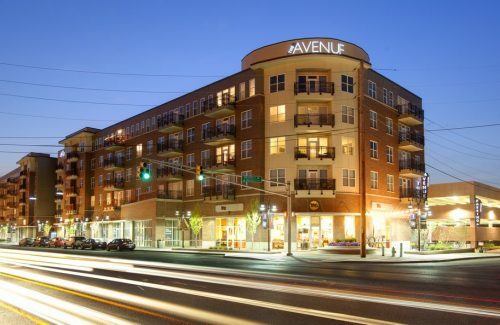 ISF Signs will match your storefront paint color closely to make the raceway blend in with the building for the most visually appealing appearance. What size should I make my face-lit channel letters?